Ali Zülfikar, born in 1970 in Turkey, studied at the Firat University. When we look at his pictures, the first thought is: A masterpiece. About 140 international exhibitions worldwide as well as numerous films about his life and his art are already known to us. Zülfikars works now decorate the Contemporary Art Fair in Paris Cutlog 2013. 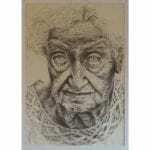 There are portraits full of power and strength which are held in black and white tones. Zülfikar treats their structures with a special essence that is used in movement of natural kilim dye. With this type of design he makes the image surfaces cracked. The contours are breaking and it creates fissures and gorges. 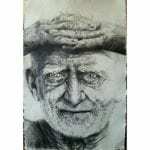 Those effectsrealise in his portraits the faces of older people: A true viewing experience! 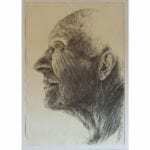 Zülfikar provides credible the age rings of human life on display and demonstrates an aesthetic of mature existence: Graceful faces that proudly represent their scars and wounds and radiate wisdom. A second issue is that Zülfikar is fascinated by trees. His formation of the branches, processed with the same cracks, provide a special magic here. A blood-red resinous tribe, whose bark is torn and worn, bears the title “A part of me”. The traces of color are like the colors of a storm, a force of nature that pulls us over. A poetry in pictures with the feeling that the life force of the tree is inseparably connected with us. The symbiosis between humans and the world of plants describes his oeuvre. All his work is dedicated to the experience of existence. Older men and women are similar to tall trees that may show their age rings with majesty. The most outstanding portrait of an old woman seems to be one thing with a golden curtain, which acts as the background of the image. At the same time, you may think that this area is a part of her hair. Fascinating is the creativity Zülfikars who can be completely lost in the faces of the human world. In addition to the large-scale paintings that repeatedly re-interpret the age issue and which are similar to lithographs, one picture jumps completely out of line, it’s the portrait and figurative painting. It doesn’t tie in with traditions but with a great sense of presence and a deep understanding of the three-dimensionality of space. For a comprehensive flood of media images that acts predominantly in the two-dimensionality on us, we are literally littered, Zülfikars works are downright opposed to their spatial depth, which is a rare quality in painting today. The process of life cannot stop in front of it – a bold but harmonious break in style. Zülfikar is like a painting philosopher, who is dedicated to the cycle of birth and death on more diverse way. Alberto Giacometti has described it as: “…It is the space that you dig to create the object and in turn the object creates the space. Is the space itself which is located between the model and the sculptor.” What does Giacometti mean with the space located between the model and the artist? A “space consciousness”? So it seems to me, because that is what Ali Zülfikar creates: a deep subtle visual space in a mysterious silence. He seems to have not only created that space between them (the artist) and his model but also newly discovered by the colors and techniques. But this space is not based exclusively on his painting works: This space is shown as an image of dreams and is created layer by layer out from the depths of the image, captured in perspective and at the same time becoming free. So I see Zülfikars painting, which arises out of itself and develops to their own color and structure by itself. I am also drawn into the spell of Zülfikars pictures: I cannot stop looking at them. The given light is green, cold, spherical and dramatically as if Zülfikar decided at times that there is no change and no turning back. We are connected with his figurative paintings that infuse the room. It becomes clearly with the structural quality of the painting that arises from such a mysterious sphere, slowly emerging from antiquity, from a forest, a time or of a dream.